This page is an overview and index to the material on this website relating to Meetinghouse Hill. Each page provides detail on an aspect of the story with documentation on where information was found. It was used in support of the effort to save Meetinghouse Field from development. As it was developed over a period of time there is some duplication of content. For a narrative version of the Story of Meetinghouse Hill visit Meetinghouse.htm. 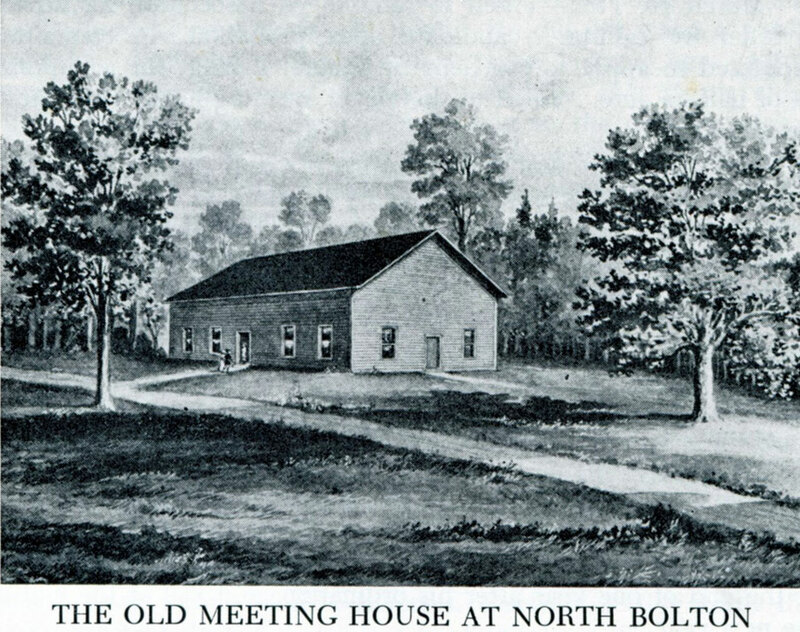 When Vernon's early settlers received permission in 1760 to establish the parish of North Bolton they immediately began planning their meetinghouse. In Eighteenth Century Connecticut there was no separation of church and state so the meetinghouse would serve as their church, government and social center. The location chosen was on the old Indian trail that had become the main east-west road through the parish. The preferred location for meetinghouses was on a hilltop and this one overlooked the Connecticut River Valley such that on a clear day the mother church in Hartford was visible. The site was also close to the only cemetery in the area on today's Bamforth Road. At this time roads were undeveloped with most families walking to church. The road they took to church each Sunday for 63 years climbed what came to be known as Meetinghouse Hill. Where it passed over a small brook a bridge was built of fieldstone to accommodate travelers. The road to Hartford became an official turnpike in 1801 and with subsequent improvements was straightened bypassing Meetinghouse Hill. When the new church at Vernon Center was built in 1826 the road up Meetinghouse Hill, still unpaved, was abandoned by the town. What was now called Old Meetinghouse Hill returned to use as a farm field. The Strong family bought the field with its red barn in 1900. It had been allowed to deteriorate but the Strong's drained the wetlands, improved the pasture and used it primarily for their herd of dairy cows, which were moved from the field to the farm for milking each day for over a hundred years. When Norman Strong died in 2010 this part of his Heritage Farm was left to his heirs in the Strong Family Trust. In 2014 the Trust decided to sell the fields. To preserve this important piece of Vernon's heritage, and one of the last reminders of our agricultural heritage, Meetinghouse Hill, LLC was formed, purchased the 33 acre property with another 18 acre field on West Road and are working to preserve it and make it accessible for town residents and future generations. Hans Weiss' 1993 original oil painting of Meetinghouse Hill field. The story of Meetinghouse Hill is forgotten or was never known by most people in town. But it reminds us of where we came from, where we are today, and what we preserved for tomorrow.